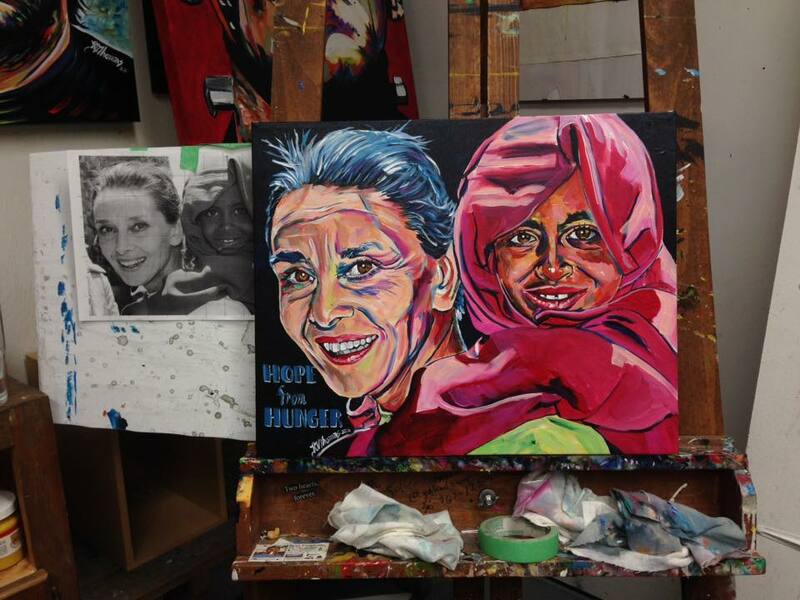 I put three words on the canvas featuring an aging Audrey Hepburn and her young friend: Hope from Hunger. Here was a global superstar who could have easily floated through her sunset years living the life of glamour and luxury. Instead, she chose to serve, and combat hunger in the world. I think of the amazing team at the Wood Buffalo Food Bank Association and the work they do every day. Since the fires, they've been a lifeline to so many families who had never been clients before. These men and women are so talented and dedicated that they could be working anywhere. They chose to serve through the Food Bank, and do it with heart, dignity and intention. I started this painting at my workshop on Saturday as part of the Empty Bowls Festival. I put the finishing touches - and three little words - on it last night. This painting is available for purchase. I will be accepting bids until the end of the week. All proceeds from the sale will be donated to the Wood Buffalo Food Bank Association to support their work creating Hope from Hunger. To place your generous bid email: russell.thomas@birdsongconnections.com, or text: 780-881-3752. It is a great cause and a colourful painting that tells a great story. I also tweet from time to time @rvthomas67.